This personalized Christmas ornament will look just adorable on anyone's Christmas tree this year.! 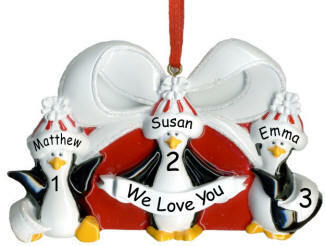 This penguin family ornament is hand painted and the penguins are wearing red and white striped hats. The 3 penguins are personalized with family members names on their hats and wording across the banner on the middle penguin. Perfect for anyone-makes a great ornament for grandparents, aunts and uncles, or as a family gift. Each ornament is hung with red ribbon, attached. Ornaments are approximately 3 1/2 in. tall. Each ornaments is strung with a red satin ribbon, ready to hang on your Christmas tree.